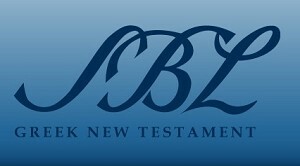 SBL is giving away the Greek New Testament for the Kindle. Considering that I never thought such a thing was possible, I can only recommend this as highly as possible. You can download it directly by clicking this link. According to the author, anyone may give away this digital file so long as we don't charge for it, so this is certainly easier than going to OSNOVA's webpage, giving them all your info, and going through a checkout, though you are free to do that, of course. Students, teachers, pastors, and interested laypersons can use the SBLGNT right now for research, writing, and study—at no cost. This Kindle file has great formatting, and the Greek letters look perfect. Now I have one less book that I have to physically bring with me to a debate. Many thanks to Michael W. Holmes for the work he put into this. I got this picture from Denny Burk's webpage. It nicely shows the sort of formatting and text you can expect from this GNT. However, I did load this onto my Kindle app for the iPhone, and it has some formatting problems in that version. Once again, you can download it for Kindle by clicking here. This is excellent—thanks for sharing! Adam, actually there is no need to go through the checkout process on OSNOVA's website or give them your info, as they also provide a direct download link from Google (see their post here: http://osnova.com/2011/06/12/sblgnt/). OSNOVA Press did a fabulous job, formatting the raw source SBL GNT to work on Kindle and equipping it with excellent formatting and a phenomenal navigation tool called DVJ-2 that allows a reader to go to any verse in seconds.